I am “slowly” starting to enjoy “fast” cooking. Normally I like to take my time and cook at my leisure. I’ve learned the bliss of a bread machine and the luxury of a slow cooker, not to mention the fun of an ice cream maker. However, my love of reviewing has changed my life in various ways. Now I love writing as much as cooking. What is a girl to do? Write or Cook? In a world filled with time challenges, I choose both. My husband also doesn’t have a regular work schedule, so when he arrives home “earlier or later than expected” I have to figure out what to cook and I don’t have time to waste. By purchasing ingredients at the start of each week and having cookbooks like “The Complete Idiot’s Guide to 20-minute Meals” to inspire me, cooking is more of a pleasure instead of a stressful experience. Cooking is always in a process of evolution. Often we look for cookbooks to inspire us in our own creativity or we are just looking for new recipes to satisfy our current cravings. Tod Dimmick is known for his writing and weekly “Gourmet Cooking on a Budget” e-mail newsletter that is read by over 75,000 subscribers. Tod has written this completely wonderful book about cooking in a day when we often feel we don’t have time to cook. He made me feel like a pro in the kitchen. There are just some recipes that make me feel like “more of a chef” than others. There is a recipe for “Chicken Marsala” on page 107 which I absolutely loved. Sure, I made a few changes because in this type of recipe, you can actually play around a bit with how you create the dish. I ended up using only the butter instead of the additional olive oil and using skinless chicken tenderloins. Also, I fried the mushrooms in the butter with the chicken and used a chicken base mixed with water instead of just a canned broth. This recipe can be taken to the level of gourmet very easily. The reason I had to change the recipe was because I only had frozen chicken and frozen chicken doesn’t really like being rolled about in flour and I was saving time by not defrosting them slowly in the microwave. So, I mixed flour with water and thickened the sauce at the end instead. Experimentation is half the fun of cooking! This section explores the elements of the successful kitchen. You learn everything about kitchen tools to spices, herbs and the ingredients for the perfect pantry. 1. Why 20-minute cuisine is an important part of today’s busy lifestyle. 2. Ingredients: The basics for the pantry, the fridge and the freezer. 3. Methods: A review of cooking methods perfect for 20-minute cuisine. 4. Equipment: A review of those key pots, pans, tools, and equipment that make cooking easier. 5. Practical Secrets: Tips for a fun, tasty, and speedy meal. Here are recipes and tips for preparation of quick, tasty entrees. Breakfast, Pizza, Pasta, Seafood, White Meats, Richer Meats, Vegetarian. Part 3: Make the Meal Complete: Side Dishes, Quick Vegetable Dishes, Breads, Dessert Time. Part 4: Theme Cuisine: Easy Timesavers, Comfort Foods, Ethnic Magic, Healthy and Delicious, Whirlwind Romance Food, Entertain Sane, Leftovers. Part 5: Behind the Scenes: Internet Sources, Inspiration, Wine-food parings, Gardening. Tod also encourage a “love of cooking” instead of just providing recipes. He believes attitude is the difference between something being a hassle or a pleasure. This perspective is built into every chapter. He actually went through a phase where he didn’t like to cook and slowly discovered the value of home cooked meals. Little “Extra Morsel” sections appear throughout the book and are helpful hints. They are just small boxes with info related to the topic at hand. Words and phrases, tips, cuisine content/background info and secrets are all revealed. You will soon see that cooking a great meal doesn’t always require a lot of time. “20-minute cuisine” becomes a pleasurable way you can cook and still have time to spend with your family. A recipe for Pasta with Chicken, Mozzarella, and Sweet Red Peppers follows. The section on Kitchen Equipment is great as he also introduces you to various “must have” items like a Pizza Stone. Probably not something you would buy being a new cook, but it will make you feel like a pro. In the Entertainment section, many of the recipes serve 8. Most of the recipes seem to serve 4-6 and I’ve made some of the recipes for two and you can freeze the leftovers.. The Glossary also includes such entries as “ right-brain cooking,” and “splurge.” Some ingredients may seem like an indulgent purchase, but will make the meal. I found most of the ingredients in this cookbook to be economical and still interesting. 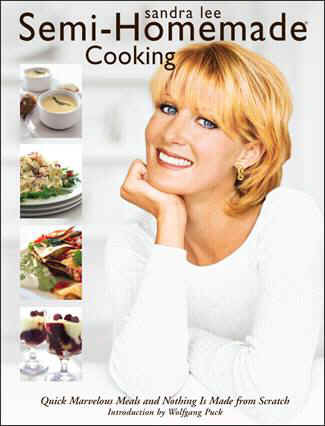 I especially enjoyed the recipes where you are cooking with wine and making quick sauces. If you feel you are often forced to make alternative choices like fast food at the drive through or frozen meals, you will enjoy this book. Tod’s philosophy will inspire you to enjoy cooking again as you delve into the pleasure and creativity of cooking. I love the way this book is written. It is as fun to make the recipes in the kitchen as it is to read the anecdotes and humorous quips while sitting on the couch.